Shaw, A., Jefferies, T, 2014. SEMPER'S JUMPER : Hard softness and soft hardness in architextile design. In the C19 the German Architect Gottfried Semper proposed that the basis for architecture lay in textile forms. This paper discusses a number of issues that have been the subject of collaborative exploration between Architecture and Textiles within the Manchester Schools of Art and Architecture. Starting from Semper’s assertion that architecture is derived from textile based sources the notion of hard softness, i.e. the concretisation of pliable and normally soft surfaces offers significant opportunities to connect exploration across disciplines. Does the idea of material need to embody its normal characteristics to be representative of itself? The paper discusses three iterations of the architectural column, introducing themes of scale, material language, constructional method and formal representation. 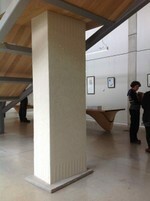 The first case study formed part of the construction of the new Manchester School of Art (2013), a 7.5m high reinforced concrete column that is directly informed by the textile heritage of the School. Based on an1886 printed wallpaper design created by Lewis Foreman Day (1845-1910) the column embodies moquette/jacquard forms in its surface treatment, which were only possible with contemporary digital design processes and advanced material construction methods. The decorative representation of the surface belies the hardness of the material, developing notions of material representation that were originally seen in historical precedents but delivered through contemporary means. An intermediate iteration was a seamlessly knitted version of the concrete column replicating pattern and form in textured knitting. 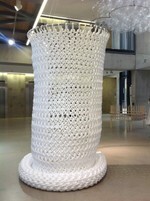 The third case study is a prototype knitted column that develops ideas of scale-less and seamless production and craft technique. The development of knitted form that uses scale as a mechanism to blur boundaries between the typical understanding of technique and material possibilities raises questions around the point at which a textile moves from the condition of garment to that of architecture. Does the nature of textile automatically infer some form of the possibility of wearability? How do the historical resonance of techniques such as knitting and weaving frame our interpretation of the formal possibilities of these processes. The expansion of scale offers soft hardness, where architectural scale suggests one form of experience, yet materialisation offers another. There is a perception that Architecture is ‘fixed’, elasticity and flexibility are seldom considered; by using iterative craft-based development, form can remain fluid until consciously fixed. The intersection of craft and digital technologies informs both these projects. Both engage with architectural and textile themes and ideas albeit from radically differing disciplinary starting points. This paper explores how the intersections of discipline, technique, material and formal possibilities offer the opportunity to develop a new understanding of the language of form and produce the re-emergence of craft as the basis for a new architecture. The importance of new modes of production are discussed as a mechanism to both open new possibilities but also re-interrogate historic ideas of design and culture, re-framing these for the contemporary age.